Earn a risk-free Live Bet and a Live Casino Bonus, every week! 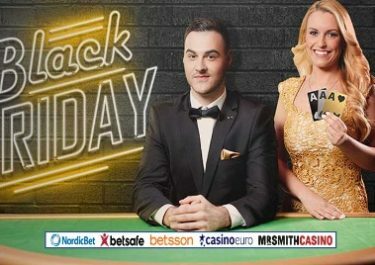 The second installment of this season-long campaign at Betsson has seen thousands of players enjoying generous perks and rewards throughout the entire European football season. Every week, players can qualify for not one, but two bonuses for the Sportsbook and the Live Casino. And they have taken it up a notch this year where the TOP10 Super Weekend risk free live bet coupons with the highest winning odds will win additional prizes. Exclusive for players from Finland, Germany, Iceland, Netherlands, Norway, Peru and Sweden. Enjoy a risk-free Live Bet and a Live Casino bonus every week at Betsson until the end of the European Football season on 12th May 2018. Both rewards will be available from Saturday to Sunday for those players who met the requirements in the running week. OPT-IN is imperative to be eligible for this promotion. To receive the two weekly rewards, players need to bet cumulatively at least €10 with minimum odds of 1.50 per coupon on any sport, pre-match or live, throughout the whole week, starting every Monday until Sunday. Each week they meet the turnover requirement, they will get the rewards on Saturday and need to use them before midnight on Sunday. Unused rewards will be forfeited. To use the reward, players need to have enough funds in their account to cover the stake of the €5 Super Weekend risk-free Live Bet. Betsson has spiced up this year’s Super Weekend, and every month the TOP10 Super Weekend risk free live bet coupons with the highest winning odds will win additional prizes: 1st – €250 Free Bet | 2nd& 3rd – €100 Free Bet | 4th to 10th – €50 Free Bet, credited to winning accounts on the first Monday of each month. The free bet must be used in full on one coupon and cannot be divided into several coupons. Net winnings from the free bet will be paid out as a bonus that must be wagered once at odds of at least 1.50 before withdrawal.